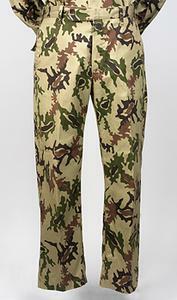 trousers Pair of lightweight camouflage patterned trousers, the design being a series of irregular splashes of dark brown, light brown, and similar shades of green on a stone grey field. Whilst Saudi Arabia had the largest contingent operating as part of the Arab League, Egypt's contribution was the next in terms of numbers and did much to strengthen the coalition against Saddam Hussein's regime. Having not seen any action since the war with Israel in 1973, the Egyptians did however have many senior officers who had direct battle experience. 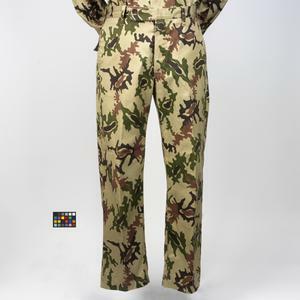 This type of camouflage patterned uniform was adopted by the Egyptian Army around 1989 and worn by all ranks as a field service uniform. This example was worn by Lieutenant Colonel Mohammed El-Keshky, who commanded an artillery regiment during the 1991 Gulf War. El-Keshky later served as Assistant Defence Attache at the Egyptian Embassy in London.